That’s an awesome HDR, I hate to disagree with so many people, but lowering the effect on the clouds (my favourite part too) would flatten the image somewhat, I like how this draws me in even giving me a sense of movement! Thank Mike, you know me and clouds! Thank you for stopping by and thank you for the comment! I am still learning how to do HDR but so far, I like! Great shot David! 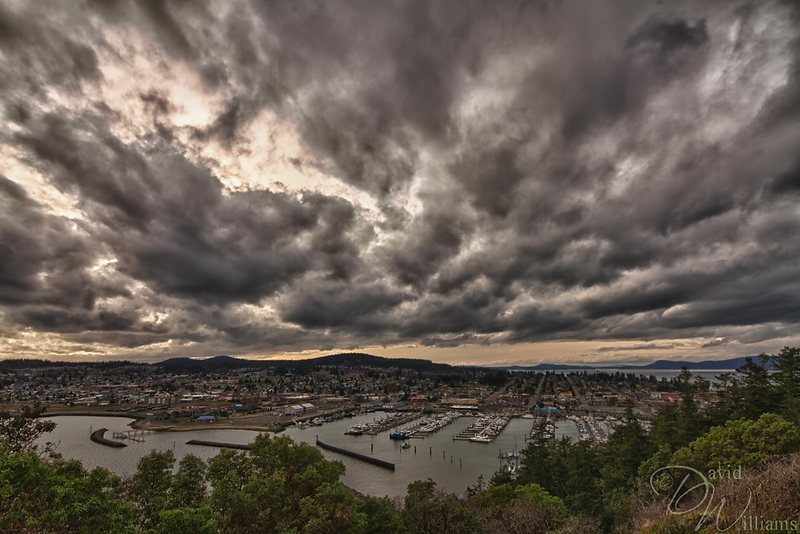 I’m not usually a huge fan of HDR, but it certainly created a dramatic effect on the sky in this image! Thank you Jim, HDR is something I have been wanting to get into (the more realistic HDR images that is…not that this one is “super” realistic) soooo, practice practice for me! Thank you for the wonderful comment, greatly appreciated! Those are quite dramatic clouds and I like the placement of horizon in this shot that emphasizes the clouds. Thank you Sasi, that little park had some really interesting views…glad I found it! This is a great HDR photo. The sky actually looks like it has a lot of weight to it – like it’s getting ready to open up. Think of HDR processing of photos like adding spices to food – sometimes a little goes a long way. Very dramatic sky. Do you use Photoshop for any of your post processing? If so, you might want to put the Shadow/Highlight tool to work and pull back the highlights a bit to tone down the hot spot in the sky (from upper middle to top left). That might help balance out the top and bottom as Mike suggests above. Nice pic! Thank you for the tip Mike, any helpful hints/tips would be great (and yes, I do use PS). What are you using for HDR? I just recently picked up Photomatix Pro, but saw that Nik Software has an interesting looking tool too. I’ve also just started trying a demo of Silver Efex Pro and absolutely love it. I too recently picked up Photomatrix Pro and am on day two of the Nik HDR Efex Pro. So far, I am impressed with the Nik software, we shall see how it goes. 😀 I do my B&W conversion in CS5, I dig the manual conversion process.